Milupa is serving up Aptawelt Learn-to-Eat Plates for children aged one year upwards. 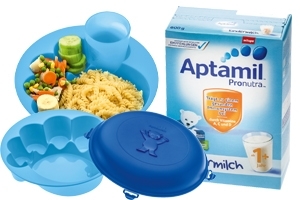 The special plates that were developed by koziol in the scope of a campaign for “Aptamil Pronutra™-Children’s Milk 1+” accompanies the toddler through its second year of life and was presented by children’s doctors during an early detection examination together with a learn-to-drink beaker and a sample packet of children’s milk. Thanks to the six compartments, i.e. for vegetables, meat and pasta and the learnto- drink beaker, children learn how to eat as easy as pie. The high rim makes it easier to spoon out the food and enables the kids to feel a sense of achievement fast. Furthermore, thanks to its big airtight lid, the plate also benefits from all the advantages of a lunchbox. The key visual of the bear is integrated directly into the lid as a haptic 3D motif turning it into a unique designer item. In addition to the successful concept, the jury also praised the sustainable production in Germany, the non-toxic materials used and the 100% recyclability of the product and didn’t hesitate to dish out a distinction in the category Custom-made Designs.